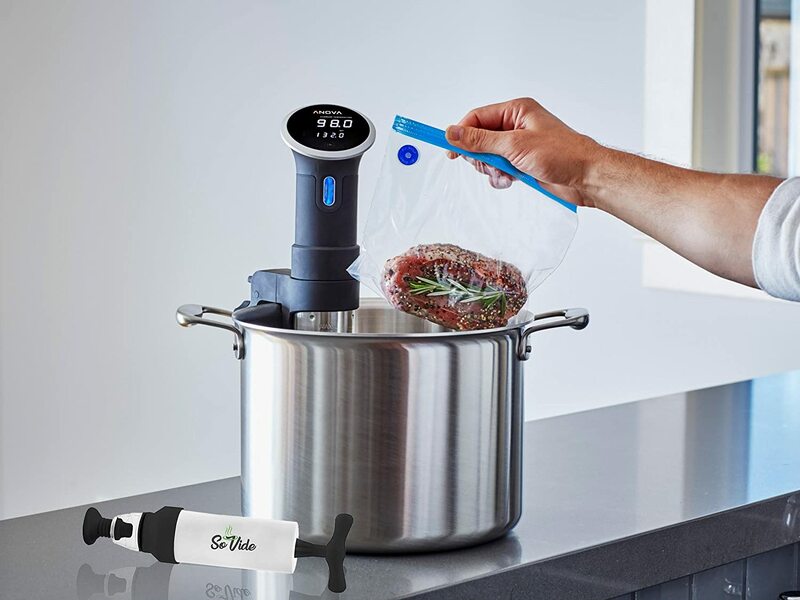 Has anyone else noticed how much one of the shots on that Sous Vide pump pack listing looks remarkably like one of Anova's official images with a bit of Photoshopping added? The bag closure has been made heavier. A blue dot added to the bag for the suction point. And their pump added (badly) to the bottom of the shot. It has a reflection but no shadow. Don't fill your container to the brim with water. The bags will displace some water as they enter the water bath. @Ember thanks gonna look into this! Does it require an air gap? I use a wood cutting board when I cook in my air fryer. Would this work as well for the pot I’m using for sous vide? You don't have to have an air gap below your cooking vessel. You can have your cooking vessel on any surface that won't be damaged by heat: stove, a few oven mitts, a trivet, etc. @Cvalk The pot will be fine, but if you're setting the pot or vessel on a surface that might be sensitive to heat (i.e. counter top), I suggest have something under the pot. I usually have my pot on top of a cutting board along with a kitchen towel. I've been at this for 2 months, so still a beginner. Most important lesson I learned: "Plan your cook, and Cook your plan". The biggest adjustment for me was timing. I was used to grilling something for 20 minutes, and didn't need a lot of advanced planning or time from grill to table. With my first few SV cooks, I always found myself rushing to finish by serving time (especially if starting with a frozen item). Now, with SV, I work backwards to be sure I start in time. I want to cook a steak for 2 hours and serve at 6pm. I DON'T setup and start my APC at 4pm. Big Duh! There are lots of other steps: 15 minutes to bring water to temp, 15 mins at the end for searing and final prep. So, I need to get started no later than 3:30, and be sure the meat is thawed at that time!! This is a lot earlier in the day than grilling. SV doesn't take more time, it just takes a different schedule. Once the water is up to temp and food is in, there's not much work until sear and serve time. Now it's part of my routine, but definitely took a mental adjustment -- especially on days when we eat a SV dinner at noon. I start cooking dinner before I eat breakfast. Second big lesson is warming serving and dining plates, especially for low temp cooks (like med-rare steaks). Ah yeah, the warming plates are a good one. I am usually okay with eating meats that are not totally warm, so I haven't yet gone the warming plate route. But I know they've been helpful for others. Especially when you're not eating right away. These are all really good tips! Did you really say grok? Fantastic and thanks for the tip. Another suggestion for beginners I learned from this group: Batch Cooking!! Sunday is frequently "Sous Vide Sunday" at our house. We usually have dinner at noon, cooked with the APC. I cook enough for 2 meals at the same time, so have "leftovers" ready for later in the week. And, if I'm ambitious, I'll have a different item ready to go after Sunday dinner is cooked. Most often it's a double batch of chicken followed by pork chops (or vice versa). I store the SV meals in the fridge (safely below 40F) for 8-10 days. When we want to eat, its an hour at 130, and time for dinner! Needless to say, my wife LOVES this idea. Love it! I wish I had an Anova back when I was weight lifting and eating a bunch of chicken breasts during the week. Would have made cooking so much easier. My diet has since changed. Very good idea!! !